A dear friend sent me almost 2 kilos of eggplants that she harvested in her kitchen garden. 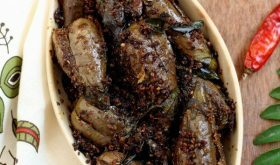 Made vankaya pachadi (chutney), gutti vankaya kura (stuffed brinjals) and vangi bhath (eggplant rice) last week and my family felt that I was going overboard with eggplant recipes. 🙂 I still had a good amount of this purple beauty sitting in the refrigerator that I wanted to use as quickly as possible. Today, I made an Indo Chinese style eggplant dish from Nita Mehta’s book which I cooked for the first time. I tweaked it to suit my family’s palate and it turned out reasonably good when paired with a bowl of hot steamed rice. You can substitute the eggplants to what you have one hand. Okra, potatoes, paneer or tofu make for good substitutes. 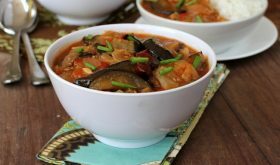 The original recipe called for the use of the large purple eggplants that are used to prepare baingan bharta but I used the smaller purple variety. Peel the eggplant and cut into 1/2" thick slices. Cut each slice into 3/5" broad fingers. Sprinkle a large pinch of salt on them and keep aside for 15-20 minutes. Strain the contents that have been pressure cooked and keep the tomato stock aside. Heat oil in a pan, stir fry the onions till transparent. Add red chilies, pepper powder and salt. Add the tomato stock and bring to a boil. Reduce flame, add tomato ketchup, sugar, vinegar and soy sauce. Simmer for 5 mts. Add the cornflour-water mixture slowly, stirring continuously. Simmer for 2 mts and the sauce will thicken. Turn off heat and keep aside. Heat oil for deep frying in a heavy bottomed vessel. Once hot, reduce flame to medium and deep fry the eggplant pieces till soft. Remove onto an absorbent paper. I added 1/4 tsp garam masala powder (not in the original recipe). 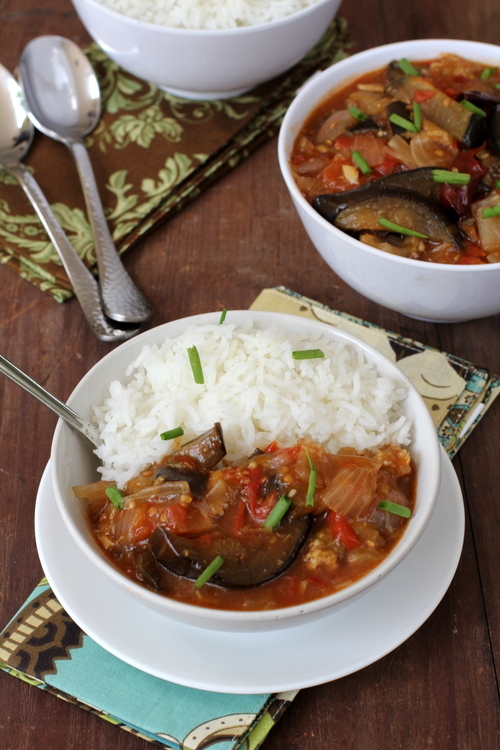 By Sailu Published: February 3, 2013 Eggplants in sweet and sour sauce is an Indo Chinese recipe served with steamed rice. 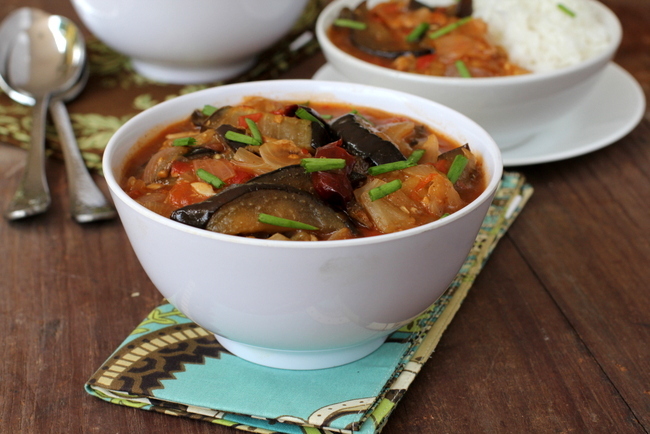 A gem among Eggplant recipes that is vegan too. How do you pressure cook the tomato and onion??? It will stick to the bottom of the pan. Place them in a stainless steel or aluminum bowl and add water and pressure cook.